The British Rail Class 86 is an electric locomotive built during the 1960s. One hundred of these locomotives were built by English Electric at their Vulcan Foundry, Newton-le-Willows, or British Rail (BR) at their Doncaster works. The class 86s were built primarily to haul trains on the new West Coast Main Line between London Euston, Birmingham, Crewe, Manchester Piccadilly, Liverpool and later Preston and Glasgow. 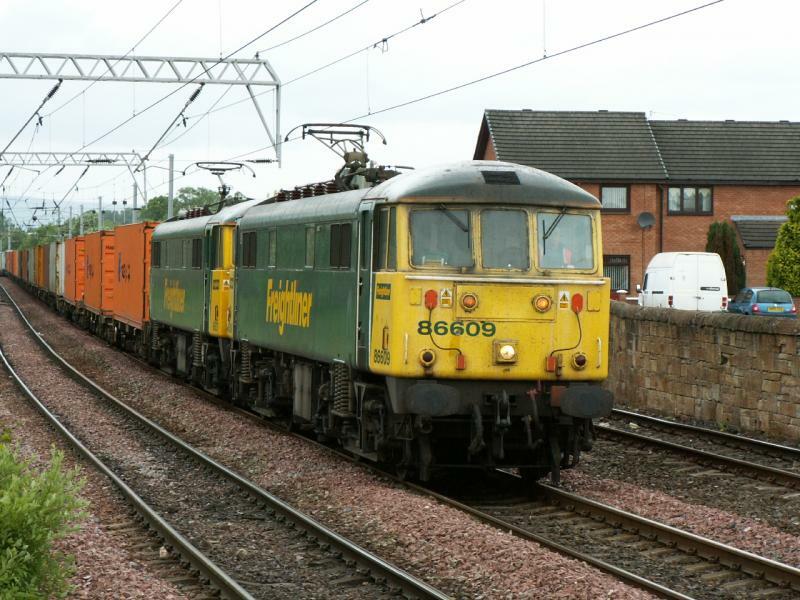 The operators with active class 86s left are Freightliner & GBRF. Two locomotives (numbered 86901/902) have been converted into mobile load-banks to test the electricity supply at selected locations around Britain. The locos can still move under their own power and are also used to clear ice off the overhead lines. The pair visited Scotland for the first time on 14 July 2005, and were used later in the month on the reinstated Larkhall branch. As of 2013, they are currently stored at Derby RTC and were scrapped in late 2016/early 2017. They operate class 86s on their intermodal trains between Ipswich and Crewe and between Crewe and Coatbridge. In 2015 Electric Traction Ltd hired a number of AC electric locomotives to GB Railfreight to move empty coaching stock to and from London Euston on behalf of Serco Caledonian Sleeper Limited. Among these were 86101 "Sir William A Stanier FRS" & 86401 "Mons Meg", the latter being named so upon entering service for CS. As well as occasional appearances hauling the revenue earning sleeper, both locos have seen use working the empty sleeper stock to and from Glasgow & Polmadie Depot since 2016. Created by brucekitchener and last modified by TheDustyBinman at 11:36, 21 of May 2018.